Weight Watcher’s Ice Cream Treats! You are here: Home / Great Deals / Weight Watcher’s Ice Cream Treats! This month my family had the good fortune to be able to taste test Weight Watcher’s Ice Cream! Weight Watcher’s & MomSelect sent us a cooler full of different kinds of ice cream treats! But, ok, on to the ice cream! Well, it didn’t last long! That’s for sure! I moved it from the deep freeze to another freezer to another freezer trying to make it last – by keeping it kind of hidden! That didn’t work out so well! Hubby & Bear, and my Mom and older son and his girlfriend, my DD and her kids! It was NOT long before it was all gone! But, everyone loved it! Everyone said it tasted like regular ice cream – in fact, my DD’s kids loved it so much she wants to replace their regular ice cream treats with it! Each of the treats have a PointsPlus value of 3 or less to help you snack smart in 2012 and stick to those New Year’s Resolutions. 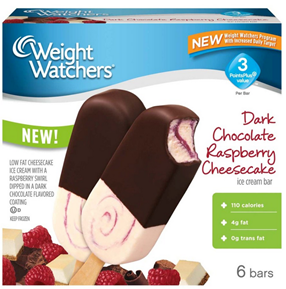 Weight Watchers Dark Chocolate Raspberry Bars: Offering an indulgent combination of fruitful raspberry and dark chocolate, these bars are made with low fat raspberry ice cream with raspberries covered with a dark chocolate flavored coating. Each bar has aPointsPlus value of 2 per bar and just 80 calories- the perfect way to add flavor to your afternoon. If you are looking for a “better for you”, snack or dessert – give these a try! You won’t be disappointed!